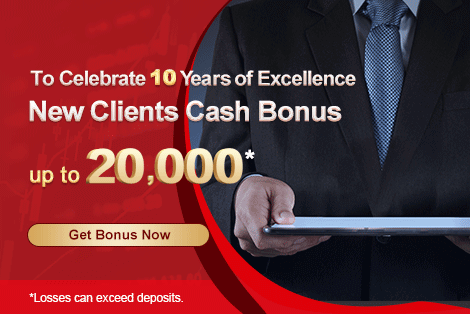 FCA Regulated Forex broker, AETOS, provides all its new clients with a great bonus up to $20000 or 20%. This generous offer is valid (for seven months), so grab it while you can and turn it into a large profit! Examples 1: A client makes $8000 deposit to receive $1000 bonus; however, before completing the required number of lots he withdraws $2500 of the initial deposit, so his credit will be reduced to $600 according to the deposit criteria ($5000-$7999). Example 2: A trader deposits $4000 (40 lots required) and trades only 25 lots during seven months; therefore, his credit will be calculated according to ($1000-$1999) = 20 lots and the rest will be lost. Example 3: a trader deposits $1000 ($130 bonus) on the day of account registration, a week later he decides to cash out, in this scenario, he must have completed 7.5 standard lots to earn $50, and the rest will be missed. Moreover, if the required number of lots are completed, the clients should contact funding_uk@aetoscg.com to receive the earned cash. How to get Aetos 25% deposit bonus? Go to www.aetoscg.com open a live trading account, apply for the Bonus up to $20000, and receive up to $20000 credit on your account depending on your deposited amount. Use your trading strategies, get down to business and the sky’s your limit! For more info on the number of lots and the deposit amounts, please check out the above table. Only newly registered clients can use this bonus. This promotion is received once per client. The clients are not allowed to combine trading lots from different accounts. If the required number of lots are not met in time, the trading credit will be treated according to the credit criteria defined in the table. Get Aetos Deposit Bonus Now!